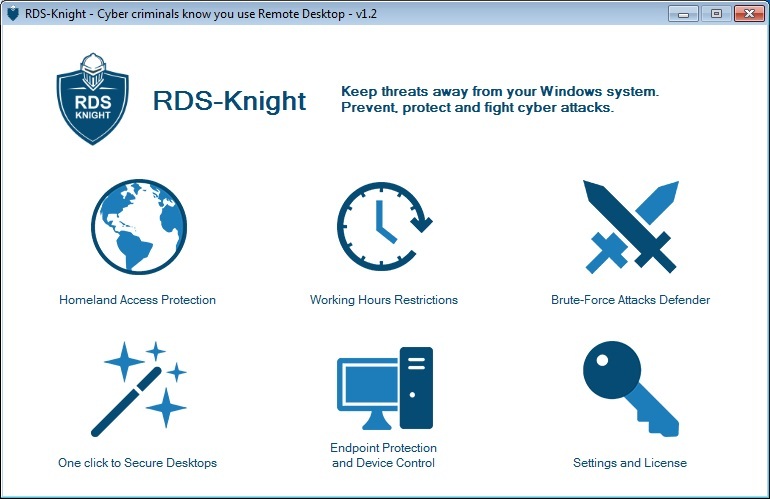 RDS-Knight is the optimal solution to detect cyber threats, defend RDS servers and develop remote desktop systems\' security. Cyber criminals know you use Remote Desktops. And you need to know your Remote Desktop vulnerabilities to mitigate your risk. RDS-Knight approach combines advanced technology, expertise and experience of our Remote Desktop cyber security specialists. Try it now! RDS-Knight will be your secret shield against cyber criminals . Easy-to-use, it will fulfill your expectations with five major features to provide a full protection to your RDS servers against hackers and malicious people. Use Geo-restriction to protect your RDS servers from any foreign attack, by blocking IP addresses that are not in your white-listed countries. Prohibit employees to connect at night with time-based control access: with Server Genius, you can specify the working time of the day when each of your user or group are allowed to open sessions. Avoid brute-force attacks thanks to Server Genius\' powerful Defender. Limit users\' rights policies in few clicks and provide them with highly secured environment. Restrict the remote access per device and prevent hackers to use a stolen Windows credential to open a session. Step into a more secure world. RDS-Knight makes it so easy and amazingly nice to enhance your security policies. RDS-Knight can be displayed in 13 different languages: English (default language), French, German, Chinese, Dutch, Russian, Hungarian, Polish, Ukrainian, Hebrew, Italian, Spanish, Portuguese. Download the right shield for your windows servers now! Restore PST file using effective Kernel for Outlook PST tool that helps you perform accurate PST repair even if PST file is severely damaged. This Outlook PST repair tool allows you to restore PST data in cases of 2GB limitation issues too.